A spur is a metal instrument composed of a shank, neck, and prick, rowel (sharp-toothed wheel), or blunted end fastened to the heel of a horseback rider's boot for the purpose of asking the horse to move forward. It is usually used to refine the riding aids (commands) and to back up the natural aids (the leg, seat and voice aids). 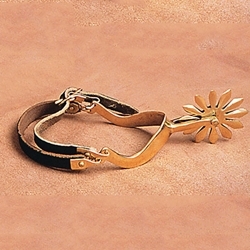 The spur is used in every equestrian discipline. There are rules in most equestrian organizations about spur use and cruelty issues. The very old word derives from Anglo-Saxon sputa, spora, related to spornan, spurnan, to kick, spurn; cf. Medieval High German Sporn, modern German Sporn, Dutch spoor, Frisian spoar. Generalized sense of "anything that urges on, stimulus" is recorded in English from c.1390. The spur's use cannot with certainty be traced further back than Roman times. Early spurs had no neck, a prick being riveted to the shank. Prick spurs had straight necks in the 11th century and bent ones in the 12th. The earliest form of the horseman's spur armed the heel with a single prick. In England the rowel spur is shown upon the first seal of Henry III, but it does not come into general use until the 14th century. The spurs of medieval knights were gilt and those of esquires silvered. "To win his spurs" meant to gain knighthood, as gilded spurs were reckoned the badge of knighthood. In the rare cases of ceremonious degradation, they were hacked from the knights heels by the cooks chopper. After the battle of the Golden Spurs in 1302 where the French chivalry suffered a humbling defeat, the victors hung up bushels of knights' gilt spurs in the churches of Kortrijk as trophies of what is still remembered by the Flemings as the Guldensporenslag (the battle of the golden spurs). For another reason the English named the French route beside Thérouanne as the Battle of Spurs. In the 15th century, spurs appear with very long shanks, to reach the horse's flank below the outstanding bards. After this time, and until the beginning of the modern period of costume at the Stuart Restoration, they take many decorative forms, some of which remain in the great spurs worn by Mexican cavaliers. Sold as a pair of spurs. Nice spurs, the leather could be better but is serviceable. You'll need period footwear to make them work and you'll want to polish them up before wearing.